The first roundabout was constructed in Paris around the Arc de Triomphe in 1901, closely followed by Columbus Circle in New York City in 1904 (Wiki). The City of Champlin constructed the first roundabouts in 2006, and residents are still struggling with how to properly use them. Deputy City Administrator John Cox says the first roundabouts were built at 117th Avenue and at Emery Village Drive along Business Park Boulevard, in conjunction with the development of Centex’s Emery Village townhouse community. 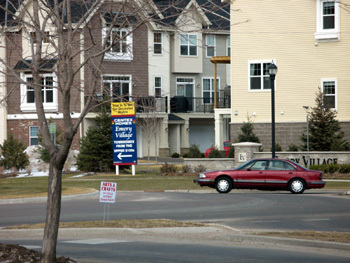 The city has four roundabouts; two more were built along 109th Avenue, near Jerry Ruppelius Park. When approaching the roundabout, slow down to 15 mph and yield to pedestrians. Look to the left, as traffic in the roundabout has the right-of-way. As you approach your exit, turn on your right-turn signal. Exit carefully to your destination, yielding to pedestrians. Passenger vehicles and small trucks are not to ride on the inner truck (concrete) ring. The truck ring allows the back of trailer/trucks or buses to ride. Currently, there are no plans for additional roundabouts,” said Cox. “We will consider their application as we consider rebuilding 109th Avenue (west or Hwy 169) and Douglas Drive (north of 109th) in the next 2 to 3 years.